WILPF’s mission is to end and prevent war; ensure that women are represented at all levels in the peace-building process; defend the human rights of women and men; and promote social, economic and political justice. The Women’s International League for Peace and Freedom (WILPF) is the oldest international feminist organisation active in the world today. We are visionaries and activists dedicated to creating a world free from violence and armed conflict in which human rights are protected and women and men are equally empowered and involved in positions of leadership at the local, national and international levels. WILPF is an international non-profit, non-governmental (NGO) peace organisation with National Sections spanning every continent. An International Secretariat works out of New York and Geneva and focuses on the work of the United Nations (UN). In 1948, WILPF was part of the first group of NGOs to receive consultative status with the UN through the Economic and Social Council (ECOSOC). We also have consultative status with the United Nations Educational, Scientific and Cultural Organisation (UNESCO) and the UN Conference on Trade and Development (UNCTAD). 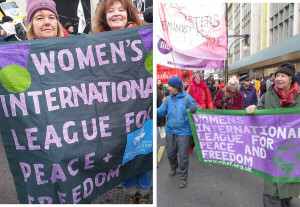 UK WILPF has Branches and groups across the UK.